The QWERTY keyboard was invented in 1847 and yet used today, largely unchanged. Are you bored of using this technology? 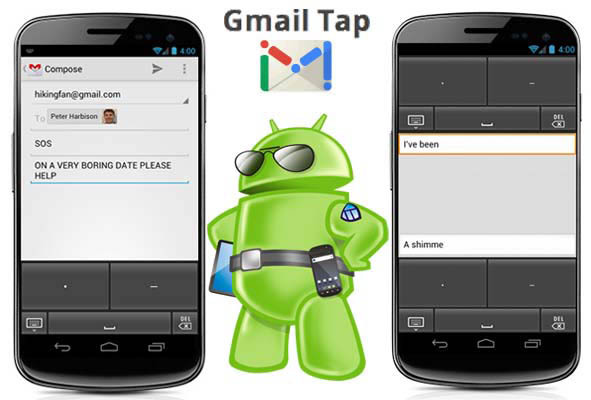 Google introduces a new input method on Android for future, called Gmail TAP. This technology reduces the effort of typing on mobile phones. the 26 characters can be typed using only two keys ( touch screen ) by the combinations of these keys. This makes users type even look into the screen or keypad. Gmail TAP is a binary language that uses only two characters dots ( . ) and dash (- ), makes it easy to learn. A space bar is also provided for easier typing. DOWNLOAD now for your Android phone. 4) Google 'Let it Snow' : Rolling out Easter eggs. 5) Music Chat through Facebook - Step by step guide. Put Smile and live Longer...! Build online store with pinnacle cart.